A great way to boost morale and efficiency in a work place is to ensure that you have a dedicated and happy workforce. What’s one way of keeping over 120 ski resort workers in good spirits you ask? Build them a great community to live in that provides them a functional, yet comfortable space of course! That’s exactly what the owners and design team had in mind when they constructed First Chair in Vail Colorado. Located in the area dubbed Lions Head Village, this employee only, four-story 34-unit building is the first of its kind in the area. It was designed and built strictly to be able to handle the seasonal nature of the area and its influx of workforce. When designing the structure the project designers blended form and function so that they not only accomplished the task of housing, but did so in a way to provide a comfortable space. 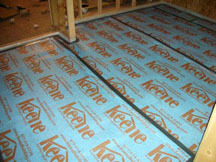 One of the many ways they accomplished this was the incorporation of Keene Building Products’ Quiet Qurl 55/025 MC MT sound mats in the floor ceiling assembly. 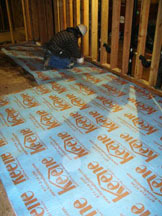 One of the more recent innovations from Keene Building Products, Muffling Technology (MT) was developed to add superior performance to an already high performance product. 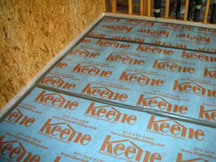 With the addition of a high loft polyester fabric to the bottom side of their Quiet Qurl sound mats, Keene was able to significantly boost the performance all while keeping the same thin profile. These types of material are essential wood frame construction so that you can provide a comfortable and private living space without the worry of noise pollution. A job at a ski resort, a comfortable living space, in one of the most scenic and beautiful places in the world.